delfin bautisa, the current director of the Ohio University LGBT Center, addresses the crowd in an introductory speech, officially initiating the rally . Photo by Zipporah Abrams. On Friday, in the midst of a cold afternoon shrouded in snow, a large trail of students could be seen bundled up in their scarves and jackets making their way to the civil war monument on College Green. 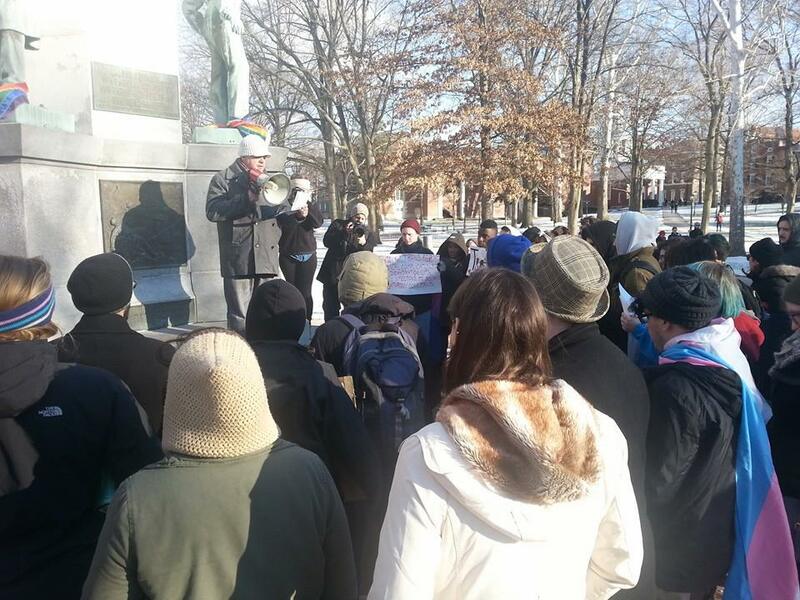 They gathered there for the Rally for Trans and Queer Justice, hosted by the Ohio University LGBT Center, in support of justice and equality for those who identify as transgender within the LGBT community. The rally started off with a speech from the current director of the LGBT center, delfin bautista, who expressed the need for not only equal legal protection and health care rights for those who identify as transgender, but for those who belong to the transgender community to be recognized as real people. bautista’s speech was met with positive reception from the crowd, who chanted, “When trans people are under attack, what do we do? Stand up, fight back!” That chant was repeated many times throughout the rally. Natalie Hansen, who recently graduated with a Bachelor’s Degree in Specialized Studies and Biomedical Engineering, and who identifies as a trans polysexual lesbian, expressed the reason why she felt it was important for her to be present at the rally. That sentiment was common throughout the rally. Several student speakers spoke about the death rate of trans people, especially in the wake of Leelah Alcorn’s death, a young teen from Ohio who committed suicide because of her rejected identity as a trans woman. 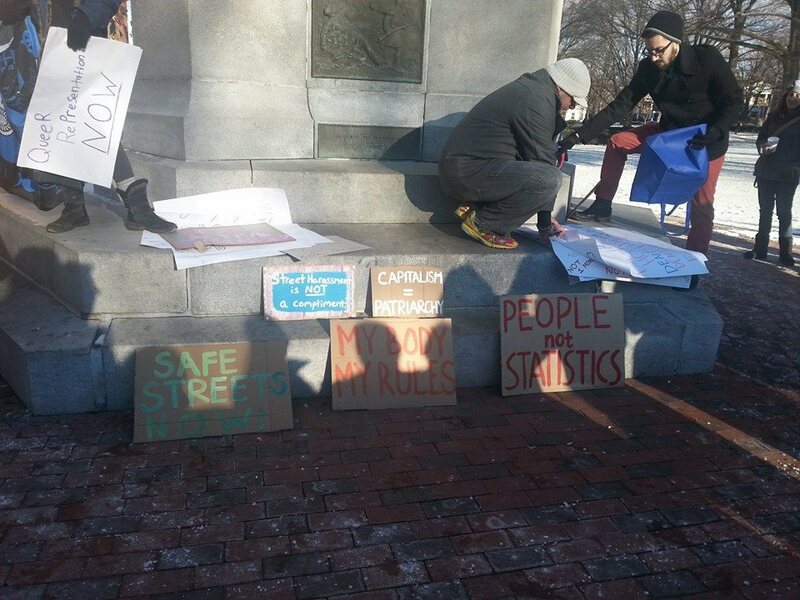 Signs on display throughout the duration of the rally promote justice and equality for LGBT individuals. Photo by Zipporah Abrams. The rally also focused on issues of racism that exist within and outside of the LGBT community. Various individuals belonging to the trans community read poems and delivered testimonials that expressed their struggles and hopes as trans issues have become more prominent in the media. Voices rang out across College Green as individuals talked about trans pride and the families that they have created on campus. Many attendees of the rally agreed that while it’s hard for them to face rejection from their families; it’s helpful to know that the people who belong to their new family accept them for who they are. “We are people; we have real issues, dreams and hopes. But too many people have had their light snuffed out,” said Ana Schmitt, a fifth-year student who identifies as a woman, when asked what she wanted the world to know about the queer and trans movement. Students can expect similar rallies in the future in order to address the injustices that continue to happen not only within the trans community, but also within the LGBT community as a whole. Those rallies serve as a reminder that there are oppressed communities of people who demand to have their voices heard.